Dreaming of studying in France and passionate about engineering? How about ECAM Lyon? Our School of Engineering, founded in 1900, is located right in the heart of France’s second largest city – Lyon. We offer an Engineering course, taught 100% in English, with a 5-year double-degree program: a Mechanical & Electrical Engineering Master’s and a Master of Science in a specialist subject. 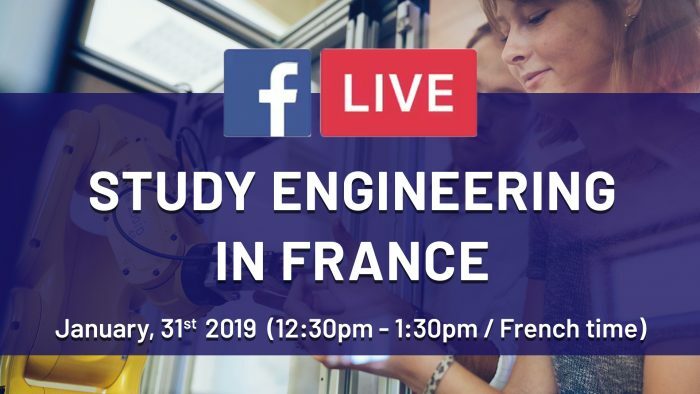 Join us this Thursday 31st January from 12:30-1:30pm (French time) live on our Facebook page to find out everything about our school, the ECAM Engineering program, admission procedures for international students and campus life. Our Student Admissions Officer, along with two ECAM Engineering students – Shruti, from India, and Malik, from Cameroon – will be there to answer all your questions. You can send us your questions, now, in the comments box or via Messenger and during our Live. Join our ECAM Lyon Facebook page to follow us live! Discover our Combined Bachelor's/ Master's Degree in Engineering.